Interior and branding design for a new perfumery concept named Perfumery & Co in the Fashion Avenue Expansion, Dubai Mall. The concept is a pavilion that evokes the intricate craft of the perfumer. The exclusive, seductive and multi-sensory destination offers bespoke fragrance and beauty experiences as well as an integrated F&B offer. Perfumery & Co sits around the boulevard atrium at entrance to the Fashion Avenue Expansion, and offers a unique retail experience by bringing together niche & artistic fragrance and luxury beauty brands from around the world. 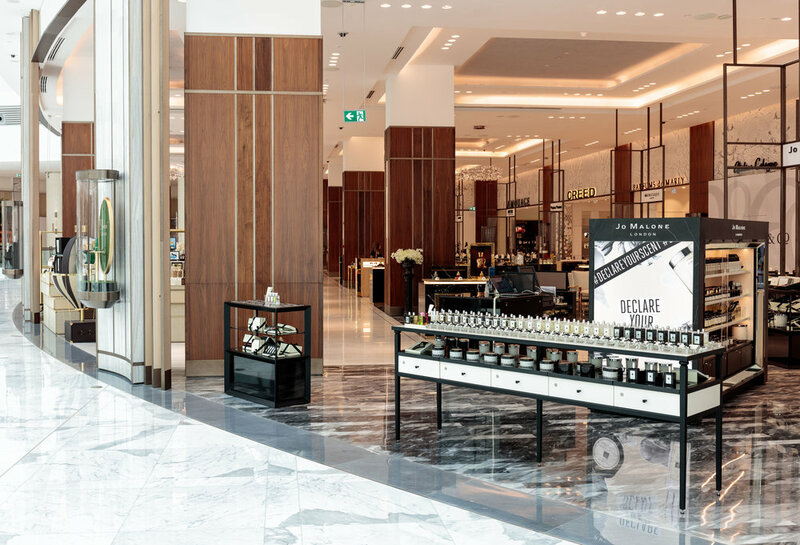 The task included developing the identity, branding, signage and interior design for the new 50,000sqft perfumery experience, located on the second-floor of Dubai Mall’s famous Fashion Avenue Expansion. The grand interior architecture, with its fine marble floors, polished silver & light gold metal work and timber and marble walls creates the perfect backdrop for luxury perfumes & beauty houses. The space for the perfumery naturally splits into three beauty halls, as it wraps around the soft curved triangle boulevard atrium. This allows for an impressive open façade that wraps around all three sides of the atrium letting customers see into the heart of each of the perfumery halls. The façade is formed of elegantly detailed marble columns, gently scalloped to allow for the beautiful oval vitrines, custom designed by Kinnersley Kent Design to display the latest perfumes and beauty products.